I imagine many of you share my love of strawberry-rhubarb, whether this is with jam or pie. In Wisconsin, however, rhubarb comes into season a few weeks before strawberries. Now, some people might just wait to bake a pie when both are available. I, instead, sought out recipes on how to make a straight-up rhubarb pie. I found my inspiration in Anne Dimock's Straight-Up Rhubarb Pie on Food52. Then, I went rogue. Disclaimer: my version is a tart pie. That means you can alter this recipe to fit your needs, as I did with the Anne Dimock's recipe. I like tart and I also like limiting my sugar intake. I have tested this recipe among friends and family and the majority do like the flavor as it, but there are a few who wish it was sweeter. It comes down to personal preference. For me, a pie crust is something you follow carefully, when it comes to the filling - experiment and figure out what works best for you and your tastebuds. For "My Go-To, Never Fails to Please Pie Crust", click here. You want to make the version listed that yields a double-pie crust. Follow instructions. The moment you put the dough in the refrigerator, start mixing your filling. Note - I never preheat my oven as I want the coolest temperature possible to work with the pie dough. 1/3 cup of brown sugar (regular sugar will also work & at this point if you desire sweeter then increase the amount). 1 1/2 tablespoons of butter (*this does not go into the mix, but on top of the mixture before you put on the top layer of dough). Optional, but the way I like to start off my pie-making: put on an episode of Twin Peaks. The theme song adds that extra bit of love to my baking. You may prefer Pushing Daisies or a Dean-Pie scene from Supernatural. They are also acceptable. Remove the ends off of your rhubarb stalks. Then chop the rhubarb into bite-size pieces. Then mix all the ingredients (all but the butter) until thoroughly mixed and the rhubarb is well coated. Roll out your bottom dough larger than your pie plate. Then place the dough, gently pushing down to fit the plate. Notice the dough will hang over the plate (which you want). Then add your filling. Next break apart the 1 1/2 tablespoons of butter and sprinkle over the top. If you want to do a lattice top, it is very easy. I do not have a pastry tool, so I use a pizza cutter and my tapered rolling pin (one solid piece of wood) to guide me as I cut the dough into strips (I do not even bother rolling out a circle, I instead roll out a rectangle with the top portion of dough). Place strips of down going in the same direction. Carefully making sure they are about the same width apart. After you have placed the strips one way, you are now ready to weave the other strips (you may need to roll out your dough again to get another set of perfect strips). Starting with the middle of your pie, place a strip of dough, alternating covering a crossing piece and picking up the next to lay over it. 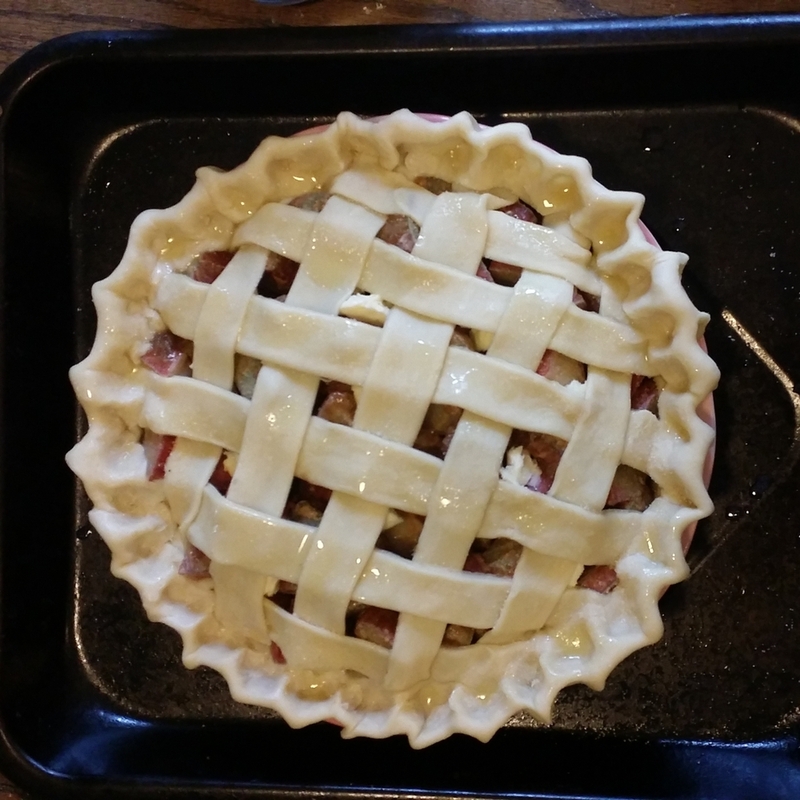 Continue outward until you have woven lattice work over all of your pie. If you have any that are long, simply trim them. 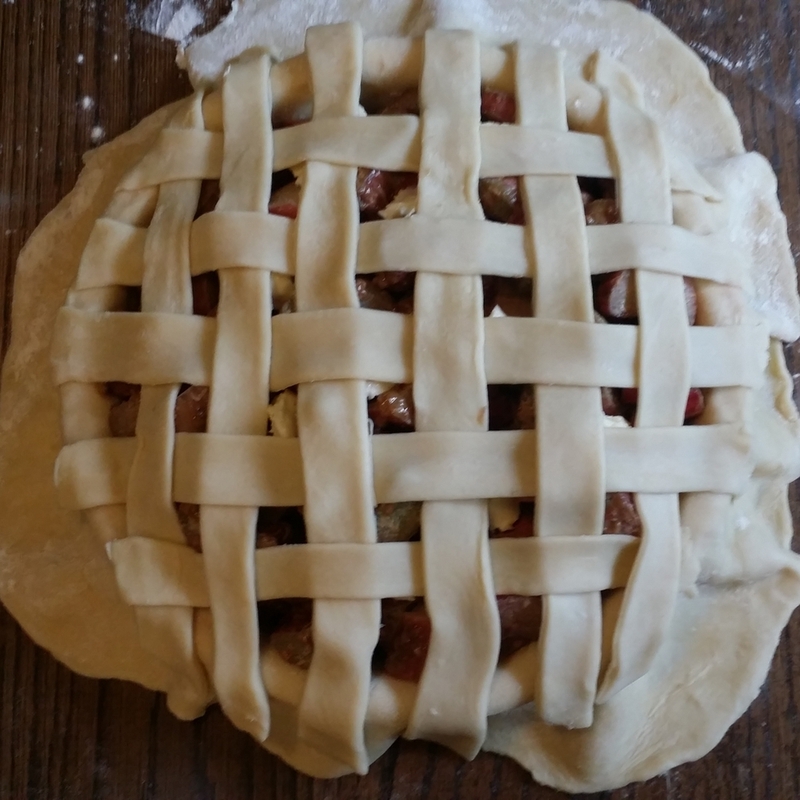 You may need to trim around the bottom dough before the next step for a more uniform shape - otherwise, simply fold the dough up over the edges of the lattice work. Once you have done this, crimp the edges. Here is a great how-to video to demonstrate. I used the pinch method on this particular pie. The pie is now ready to bake. You have the option to coat the pie with melted butter and sprinkle with sugar (will add to the golden crust look). At this point, heat your oven to 425 degrees F. Once it reaches this temperature, place the pie on a cookie sheet or another type of pan (easier to pull out of the oven) and place it on the middle of the rack in your oven. Bake at 425 F for 15 minutes. Then move to 350 degrees F and bake 25 to 30 minutes more. No oven is created equally, so you may need to increase the temperature or cut back accordingly. Which means keeping an eye on your pie and adjusting accordingly. You want your rhubarb cooked and soft (may see bubbles) and your crust golden but not burnt. Remember this is my version, but there are countless ways to alter and perfect it to make it your own. I hope you will consider a straight-up rhubarb pie as it is quite wonderful and can stand on its own. Lastly thanks to Stephanie Baughn (blog contributor for the Midwestival) for the beautiful rhubarb used in today's post.